“Is 2011 going to be the year of copycats?”, Apple’s then chief executive rhetorically asked at the March iPad 2 introduction in San Francisco. Really, the title of this article couldn’t be more true. iPad is now stealing market share from Android, climbing from 65.7 percent share to 68.3 percent globally as Android slipped from 34.0 percent to 26.8 percent. HP exited the game, having retired its TouchPad and today lackluster sales of RIM’s PlayBook tablet made the news. Our latest research continues to indicate that there is no such device slated for production this year. In our view, Apple should be in no rush. 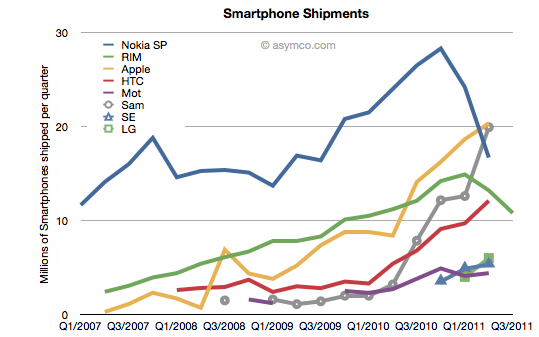 The other tablet entrants have stumbled so far, and that trend-line could persist deep into 2012. To put PlayBook sales into perspective, RIM shipped one PlayBook to every 46 iPads. With just 200,000 units, PlayBook may very well be heading to the technology graveyard. BlackBerry phones are also shrinking due to “lower than expected sales for older models”. One fifth of RIM’s stock valuation was wiped out today as a result of poor tablet and smartphone performance. By the way, RIM’s global market share is now dropping to single digits. Did the Waterloo, Ontario company learn a valuable lesson? Many watchers have written off the PlayBook, but RIM has bigger worries on its mind: Its smartphone business is declining and global market share dropping to single digits. Chart courtesy of Asymco. Hardly. RIM on its part is trying to salvage its tarnished reputation as investors increase pressure on management which burned through half of RIM’s cash in a single quarter. According to Boy Genius Report, co-CEO Jim Balsillie promised PlayBook price cuts in the form of rebates. He also hinted that a way overdue software update is “coming soon” with features missing from the initial launch. Some say it’s too little, too late. RIM’s dug itself a big hole. It’s not just the difference between shipping or actually selling something or maybe that RIM was showing off an unfinished product (it did) only to release it a year later. No matter how you spin it, the company felt compelled to rush the half-baked PlayBook to the market. Tablet buyers accustomed to Apple’s high standards wouldn’t settle for less and the Android crowd didn’t fall for it either. Of course, Apple’s lead won’t be forever and competition will eventually close the gap. And they should – we’d hate to see Apple stop innovating. IDC predicts Android’s share of the global tablet market to recover to 25.9 percent in the holiday quarter as vendors introduce new Android-powered competitors. We know the Amazon tablet is coming in time for Christmas and supply chain checks show an unusual production ramp of 10.1-inch touch panels – ten million a month – suggesting an onslaught of Android Honeycomb tablets. But Apple won’t be standing still either so it’ll be exciting watching how everything pans out. One thing is certain: Mobile space has been turned upside down and we’re witnessing the behemoths around us crumbling. And at the forefront of it is a hip team from Cupertino, California – a marketing agency, a gadget design shop, a computer maker turned cell phone vendor (depending on who you ask) – which stands to gain an enourmous influence due to its co-founder’s unique understanding of what consumers want.